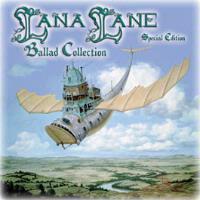 A two-disc set, this one includes both ballad collections (volume one and two). The album features a number of great prog ballads and several interesting cover renditions. Among those covers are Lane's takes on Elton John's "Goodbye Yellow Brick Road," Marillion's "Seasons End," and the Beatles' "Across the Universe." The only real complaint is that with the focus on just balladic cuts; it tends to get a little monotonous at times. Still, with such stellar musicianship and Lane's incredible voice, that is really only a minor issue. Strong and evocative, this is quite a powerful ballad that at times feels a bit like Klaatu and features vocals that call to mind Heart. A more guitar based cut, this one is a quite straightforward rock ballad material. The chorus on it is in a definite arena rock sort of style. A cover of Elton John's YBR, this cut is very straightforward, but Lana's voice is very strong here. There is a killer sound on the keyboard solo. Based on an acoustic guitar melody, this is another cut that feels a bit like Heart. It gets quite lush and proggy after a while and links straight into "Nevermore". This one continues themes begun in the last cut, becoming more progishly powerful at times. This one runs straight into the next cut. This brief piece is a continuation of the themes from the last two numbers. A great retro sound and wonderful arrangement makes up this one. The chorus has that Heart-like mode, but in a prog mode. This one moves into an awesome prog jam with some killer bass work. It gets very powerful. This is a great Manhattan Transferish nearly acapella cut that serves as an intro to the next piece. Keys begin about a minute or so in to begin the transition to "Wind on the Water". Coming in strong and a little crunchy, this is a killer track that resolves into a killer slow prog groove. Beginning with percussion, this is a slow and dramatic prog ballad with some great guitar textures. As the verse enters, the cut becomes more lush and sedate. This is a dramatic prog ballad that feels a bit like Renaissance. It gets very powerful. Somewhat playful but all prog, this is a lighthearted cut. It seems to take on a bit of a lounge lizard sort of a texture after a time, though. Rather neo-classical and quite dramatic in tone, this one is very powerful. Dramatic textural keys begin this one, then the piano starts building. As the rest of the instruments join in, it becomes a slow moving but powerful number. As the vocals enter, the intensity drops, but progish changes are found throughout the piece. Dramatic acoustic guitar begins this one, and it starts a slow building process. It gets very dramatic and moves through a lot of intriguing and quirky changes, becoming a bit of a prog extravaganza extraordinaire. Beginning with some great keyboard textures, it drops to just piano and vocals in a nicely building balladic style. The arrangement becomes quite lush with string type instrumentation acting as the icing on the cake for a time. A cover of the title track of Marillion's first non-Fish CD, this one is quite a powerful and dramatic number. I think I prefer the original, but this is a very solid rendition nonetheless. Rather intricate and pretty, this is another strong cut. The percussion arrangement is really interesting on this one. It is another that that features Heartish vocals. It gets very dramatic after a time. Written by Jeff Lynne and originally performed by ELO, this cut is a great ballad. It is very evocative and has some great musical textures. This cut is a bit bouncy and was originally a David Gates track. Beginning with rather creepy sound effects, as the instruments come in it is in a very dramatic and intriguing ballad format. This mode continues for a short time, then very fusion oriented tones explode and run the cut to its conclusion. This one essentially serves as the intro to "Takes A Breath". Coming out of the last piece, this slows back for the vocals, and the elements from that last number remain, but take a more back seat approach. As the chorus enters, the song becomes quite hard-edged, almost metallic. This is a very potent and intriguing piece that is quite creative in its arrangement. It features a killer talk box guitar solo. Another cover, this time a Beatles' track, this one works very well. Lane's voice adds a wonderful delicate texture to the piece. A nice string arrangement and interesting percussion modes complete the picture. This gets a bit harder edged as it carries on. A dramatic reworking of the earlier cut "Avalon"; this is a killer instrumental rendition with some great crunchy guitar work.